The Joy-Cons are the main controllers of the Nintendo Switch that can be used in Splatoon 2. The Joy-Cons are the main controllers for the Switch, and two are included with every Switch, with extra's sold separately. They are small controllers, that can be slotted into both sides of the Switch Console to form the Gamepad esque Handheld mode, slotted into a Joy-Con Grip to form a more conventional controller, or used separately such as one in each hand, or as a controller each for multiplayer games. They Joy-Cons include SL and SR triggers, HD Rumble, and motion controls, and the Joy-Con (R) contains an IR camera and NFC pad. The is replaced by directional buttons, to help 2 player modes. For a more traditional alternative, the Switch Pro Controller is also offered. The Joy-Con Grip compared to the Joy-Con Charging Grip. 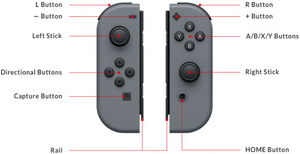 The Joy-Con Grip is an accessory included with every Nintendo Switch, that the player slots the Joy-Cons into either side ofto form a more conventional controllerhowever it does not add any more features. The Joy-Con Charging Grip is separate accessory that charges the Joy-Con while using it, and has a translucent plastic backing rather than the matte style plastic used in the regular grip. : Allows players to transform into squids or octopuses. In this form, Inklings and Octolings are able to move faster through their own ink and jump farther. Directional Buttons: Up and down on the directional buttons is used for Signals. On the map screen, holding while pressing Left, Right or Up will slow the player to Super Jump to a another player and Down super jumps to the Spawn Point. Motion controls: By tilting the Joy-Con up, down, left, and right, players are able to change their Inkling's view and aim, and to move the cursor to Super Jump. : Allows players to splatter ink using a variety of weapons. In Inkopolis Square, this button is used to zoom in on specific landmarks. : Causes the player's Inkling or Octoling to jump and is used in some menus to exit the current selection or action. NFC Pad: Used for reading amiibo. Soon after the ARMS Direct, Nintendo announced new Splatoon 2 themed Joy-Con colors, Neon Green Joy-Con (L) and Neon Pink Joy-Con (R), along with other Splatoon 2 themed accessories including a Splatoon 2 themed Switch Pro Controller. They are sold separately in Japan, as a pair in Japan and Europe, or in a bundle with a Nintendo Switch, Splatoon 2 and a Splatoon 2 themed carrying case in Japan and America. They were released on the 28th July, a week after the release of Splatoon 2. Neon Green and Neon Pink Joy-Con straps were also offered exclusively in Japan. On the 5th of January 2018, Joy-Cons with the swapped color scheme of Neon Pink Joy-Con (L) and Neon Pink Joy-Con (R) were announced, available by choosing them in the custom Nintendo Switch configurator in Japan or sold as a pair in America. The Joy-Con Grip and tabletop mode. The Joy-Con Grip and TV mode. The Joy-Cons and the Switch Console in Handheld mode. The Joy-Cons in the Joy-Con Grip. Official promo art of the Hero vs. Villain Splatfest, where Pearl and Cap'n Cuttlefish are seen using Joy-Cons. ↑ Nintendo of America on Twitter: "Keep your #NintendoSwitch looking fresh when you play #Splatoon2 with these new Neon Pink and Neon Green Joy-Con controllers! Look for them in stores later this month."